Inspired by i09′s Death Week* and more specifically, their re-posting of Charlie Jane Anders‘ Ten Coolest Death Scenes in Science Fiction History, I got to thinking about how many characters bite the big one in pilots. Death often marks a beginning — often for the survivor learning to carry on, but sometimes even for the dead getting on with the afterlife. So, going to the great DVR in the sky makes a good event for a first episode. Here are some of my favs, in no particular order. George, Dead Like Me – Her death is so random, you have to love it: conked on the head by a toilet seat from space. And her demise is really when she starts living. The kid who dies at the end of the Game of Thrones pilot — Tell me you didn’t gasp. This horrifying moment showed the audience that GOT is a show where Anyone Can Die. 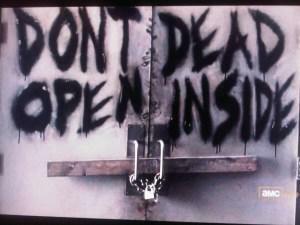 Everybody, The Walking Dead – “Don’t Open. Dead Inside.” So cool. Also, the half-woman crawling across the ground is a pretty sweet special effect.